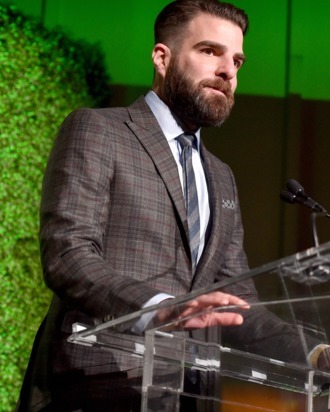 Zachary Quinto speaks onstage during the 12th Annual US-Ireland Aliiance’s Oscar Wilde Awards event. Zachary Quinto isn’t wild about the Trump administration’s recent rescinding of transgender bathroom protections in public schools — in fact, he’s adamantly opposed to it. As he revealed while accepting an award at the U.S. Ireland Alliance’s 12th Annual Oscar Wilde Awards, it was the 19th-century author’s own struggles with his sexuality that inspired the openly gay Star Trek actor to speak out on behalf of those deemed to be different. “I discovered Oscar Wilde at a time in my life when I was discovering myself, and he’s someone who has, to me, represented authenticity of truth, and never backing down from who he was, and how he saw the world, and how he moved through it,” Quinto told the crowd, which included his partner, model and painter Miles McMillan.